Centaurea diffusa is a 0.2-1.0m tall, biennial or short-lived perennial species, with a long tap root. The plant is well adapted for survival in disturbed, semiarid environments as typified by degraded rangeland and pasture, fallow land, neglected residential and industrial properties, gravel pits, clearcuts, river and ditch banks, and transportation rights-of-way. It appears to grow best on well-drained, light textured soils. It is not tolerant of flooding or shade. Seeds can be dispersed by manure transportation and when seed-laden plants become attached to the undercarriages of vehicles and equipment. Seeds can also be dispersed by wind, water, humans, and by wildlife foraging activity. Movement of contaminated forage and feed grains by livestock producers has also contributed to the weed’s widespread distribution. Carpenter and Murray (Undated) report that C. diffusa is a highly competitive herb of the sunflower family (Asteraceae). The plants first form low rosettes and may remain in this form for one to several years. C. diffusa is 20cm to a metre tall with a long tap root (NWCB, 2001). Carpenter and Murray (Undated) state that the stems are upright, 10-60cm tall from a deep taproot, highly branched, angled, with short, stiff hairs on the angles. There are two types of leaves. The long, deciduous basal leaves, which form the rosette, are stalked and divided into narrow, hairy segments, 3-8cm long, and 1-3cm wide. The stem, or cauline, leaves, which are alternately arranged on the stems, are smaller, less divided, stalkless, and become bract-like near the flower clusters. Flower heads are broadly urn-shaped, 1.5-2.0cm tall, solitary or in clusters of 2-3 at the ends of the branches. Bracts of the flower heads (phyllaries) are yellowish with a brownish margin, sometimes spotted, fringed on the sides, and terminating in a slender bristle or spine 1-5mm long. The heads contain two types of flowers: ray flowers around the edges surrounding tubular, disk flowers. The petals are white, rose-purple, to lavender. Achenes are 2-3mm long, light brown to black, bristles (pappus) generally absent or a mere fringe less than 1mm long. Carpenter and Murray (Undated) state that the seeds demonstrate polymorphic germination behaviour, which distributes seed germination over time. Two types of dormant seeds, light sensitive (50-60% of total) and light insensitive (35-45% of total), and one non-dormant type of seed (5% of total), were found in the seed samples. If moisture is available, the non-dormant seed will germinate in the autumn immediately after dispersal. The two dormant types of seeds do not germinate until spring. 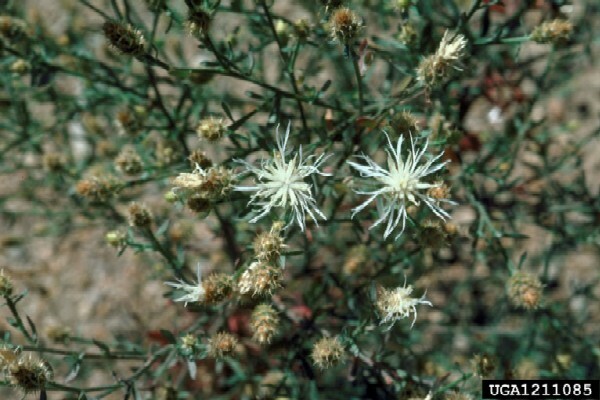 Carpenter and Murray (Undated) report that C. diffusa is one of the most important rangeland weeds in North America. 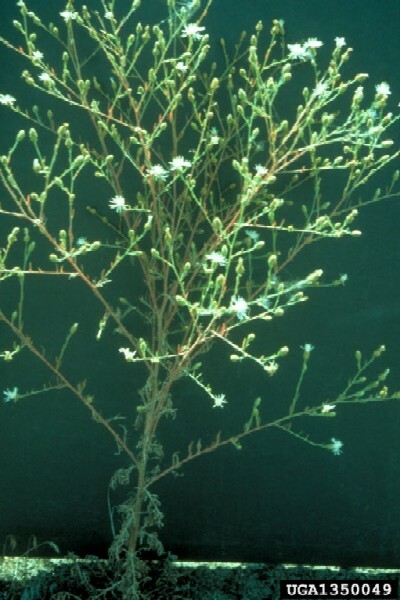 Depending on the environment and plants that it is associated with C. diffusa can be a highly competitive and aggressive plant that forms dense colonies in pastures, over-grazed rangelands, croplands, and along riverbanks. C. diffusa expresses strong somatic polymorphism which helps explain tolerance to drought, seed production, and vulnerability to repeated cultivation. It is especially adept at spreading along rights-of-way and farm roads, and can spread rapidly. Disturbed or overgrazed lands are prime candidates for colonisation, but it will also invade undisturbed grasslands, shrublands, and riparian communities (although infestations are typically less dense). 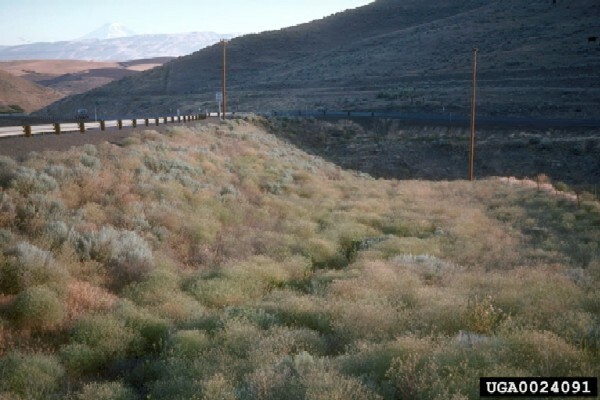 It has a northern limit of 53º N latitude, and has been observed at elevations up to 2150 m. It can thrive in semi-arid and arid conditions, which causes it to be a serious problem in the western United States and the arid southwestern interior of Canada, especially British Columbia. The density of a stand is often correlated with the level of soil disturbance. Additionally, C. diffusa prefers open habitats to shaded areas. It is not common on cultivated lands or irrigated pasture because it cannot tolerate cultivation or excessive moisture. Zouhar (2001) states that it is tolerant of a wide range of total precipitation and temperature conditions but does best in areas receiving between 305-432mm of annual precipitation. While plants may regenerate from the crown, it reproduces primarily by seed (NWCB, 2001). Carpenter and Murray (Undated) report that after they reach a threshold size, they bolt, flower, set seed, and then die. Thus they may behave as annuals, biennials or short-lived perennials, bolting in their first, second, third, or later summer, respectively. Plants of this type are often called semelparous perennials or short-lived monocarpic perennials. A single plant can produce up to 18,000 seeds, and a stand of C. diffusa can produce up to 40,000 seeds per square metre. Centaurea diffusa seed was first collected in the U.S. in a Washington state alfalfa field in 1907 and is thought to have been introduced through impure Turkestan alfalfa or possibly hybrid alfalfa seed from Germany (Carpenter and Murray, Undated). Review: Dr. Larry Larson, Department of Rangeland Resources, Oregon State University, Corvallis, USA. 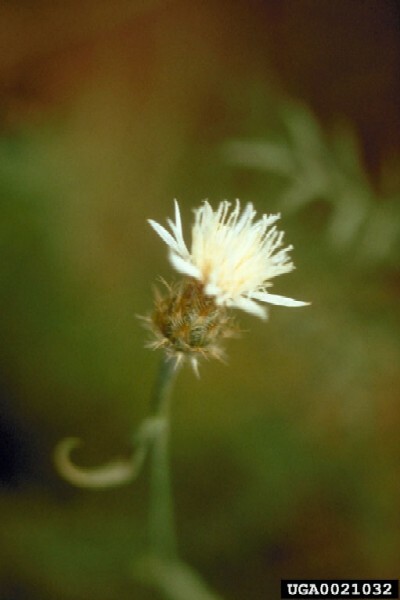 Recommended citation: Global Invasive Species Database (2019) Species profile: Centaurea diffusa. Downloaded from http://www.iucngisd.org/gisd/species.php?sc=313 on 22-04-2019. Zouhar (2001) reports that many environmental and economic losses have been attributed to C. diffusa infestations. Examples include replacing wildlife and livestock forage on rangeland and pasture, depleting soil and water resources, displacing native species on wildlands, reducing biodiversity, reducing land value, and disflavouring milk. Carpenter and Murray (Undated) state that C. diffusa is a pioneer species that can quickly invade disturbed and undisturbed grassland, shrubland, and riparian communities. Once established, it outcompetes and reduces the abundance of desirable native species. It contains the allelopathic chemical cnicin, which can suppress the growth of other species and allows it to grow in single-species stands. These stands can produce up to 40,000 seeds/sq m, which enables the infestation to proliferate rapidly. On rangeland, it is generally unpalatable to livestock, and the spines of C. diffusa may cause injury to the mouth and digestive tract of grazing animals. Infestations can greatly reduce dryland forage production with estimated losses of up to 88% in some areas. A 1979 report estimates that the annual loss from reduced grazing due to its infestation costs ranchers 80 cents per acre (NAPIS, 1993). Carpenter and Murray (Undated) report that on agricultural land, it can greatly reduce the value of hay and can decrease the value of the land. Other losses include soil erosion, and reductions in wildlife populations due to the decrease in forage production. 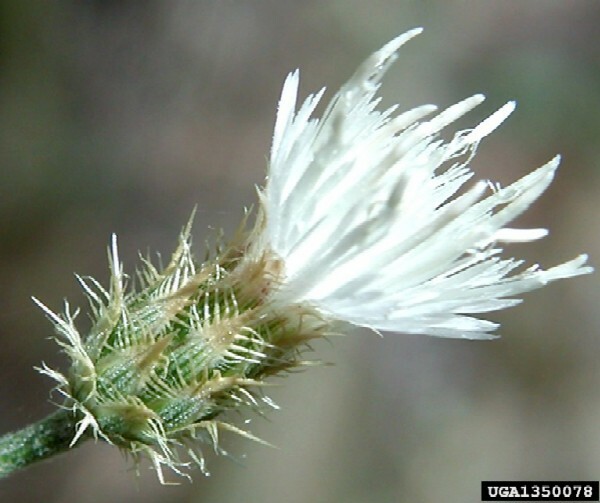 In the North American Region it is a designated undesirable species in Colorado, a restricted noxious weed in Arizona, a candidate species for the New Mexico noxious weed list, and a designated weed species in Utah. It is listed as a noxious weed in British Columbia, Manitoba, and Ontario. As a precaution, anyone working with diffuse knapweed or other knapweed species should wear protective gloves and avoid getting knapweed sap into open cuts or abrasions. Carpenter and Murray (Undated) report that a successful management program should set a goal of < 5% C. diffusa cover. This is the assumed density of the weed in its native range. Lasting control will require a combination of proper land management, biological control, physical control, chemical control, and suppression by desirable vegetation. This \"cumulative stress\" method will keep the plant constantly under stress, reducing its ability to flourish and spread. An effective management program needs to first control existing infestations, and then develop a land management plan to deter re-infestation. Since it reproduces entirely by seed, the key to controlling existing infestations is to eliminate new seed production and deplete the existing seed bank. Effective, long-term control will be extremely difficult without development of effective biocontrols. Once the existing infestation has been controlled, steps such as hand pulling or spot herbicide treatment programs should be taken to deter any new infestations; this should be done three times annually for several years to eliminate any seedlings that germinate from seeds that break out of dormancy. Informations on Centaurea diffusa has been recorded for the following locations. Click on the name for additional informations. Carpenter A. T. and Murray T. A. [Undated]. Element Stewardship Abstract for Centaurea diffusa Lamarck. The Nature Conservancy. National Agricultural Pest Information System (NAPIS), April 1993 Fact Sheet Center for Environmental and Regulatory Information Systems, Purdue University. Summary: Short summary of description, distribution, habitat and management. Rejmanek and Pitcairn, 2002. When is eradication of exotic pest plants a realistic goal? In Turning the tide: the eradication of invasive species: 249-253. Veitch, C.R. and Clout, M.N.(eds). IUCN SSC Invasive Species Specialist Group. IUCN. Gland. Switzerland and Cambridge. UK. Roche, B. and C. Roche. 1999. Diffuse Knapweed. In Biology and management of Noxious rangeland weeds. Edited by R. Sheley and J. Petroff. Oregon State University Press. Summary: Detailed report on description, dispersal methods, habitats and control. Kiemnec, G., L. Larson, and A. Grammon1. 2003. Diffuse knapweed and Bluebunch wheatgrass seedling growth under stress. J. Range Manage. 56:65-67. Larson, L. and G. Kiemnec. 2003. Seedling growth and interference of diffuse knapweed and bluebunch wheatgrass. Weed Technol. 17:79-83. USAERDC (U.S. Army Engineer Research and Development Center) 2002 Centaurea diffusa Lam. (Diffuse Knapweed) Waterways Experiment Station, Missouri. Summary: Short report on description, distribution and growth characteristics.